I was playing around with Audacity, a free open source audio editing software, and I noticed my “microphone-in” was not working but my “microphone-in” via my USB web camera worked fine. After spending nearly a day trying to figure out the problem in Windows 7 I finally figured it out. To make it worse the microphone worked fine one minute then stopped working the next. The problem turned out to be the “microphone-in” and “line-in” use the same jack. On Windows XP it did not matter what you plugged in, it would auto detect between microphone and line in but apparently it does not in Windows 7. Right click on the small speaker icon on the bottom right of your screen and select Recording Devices. You should then see a window with microphone, line-in and other devices displayed. To make the “microphone-in” the default device you have to right click the “line-in” icon and Disable the device otherwise the “microphone-in” will be unavailable although it is selected as default. To check if the problem was Windows 7 I had to reboot my computer to an earlier XP version, as I have made my system a dual boot for this type of testing. Now I had to reinstall Audacity into Win XP. Well everything worked fine, my microphone was recognized and recorded fine. So this proved the machine and microphone were OK so the problem must be with Windows 7. Re-booted back and re-upgraded the latest drivers for my Realtec AC 97 audio system. Still no joy, that is when I went back and fourth checking settings. With occasional inspirations for searching Google. That is were I got the idea to disable the line-in which made available the “microphone-in”. Any comments or questions please leave message below. This entry was posted in Computer Stuff and tagged Audacity, Computer Stuff, Windows 7. Bookmark the permalink. 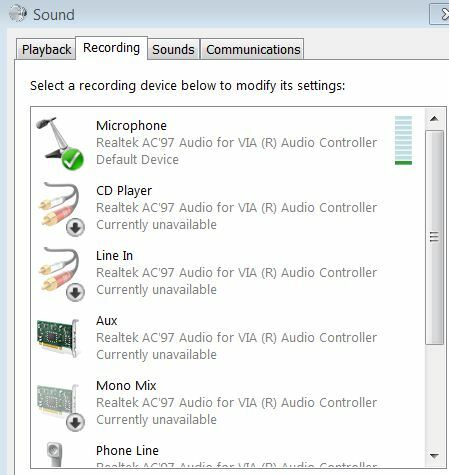 3 Responses to Windows 7 "microphone-in" problem with Audacity software. like what you’re saying and the way in which you say it. You make it entertaining and you still care for to keep it smart. I cant wait to read far more from you. This is really a great website. I recorded the script of one of my YouTube last night. Today I wanted to record an ambience track for it…and Audacity didn’t detect the mic. Bizarre, I had changed nothing. Google gave me your page. I’m pretty useful with Windows but I never even knew that the front panel mic input doubled up as line. Nor that it could work with a mic one day ad not the next. You saved me a great deal of frustration – thanks!